Geodetic imaging such as InSAR combined with GPS has provided the means to view the surface deformation caused by earthquakes at a high level of detail, but currently these images require up to several days to be created by an expert. Scientists at the California Institute of Technology and the Jet Propulsion Lab have been working to automate the creation of these images, making them useful in emergency response after an earthquake. The combination of InSAR and GPS provide information on what exactly moved when, and allow for a quick determination of magnitude. InSAR is a technique where a satellite flies over a region, taking a picture of the topography with radar. When the satellite flies over the same region at a later time, say before and after an earthquake, scientists can compare the two images pixel-by-pixel and see exactly what moved. During large earthquakes, some regions will shake and move more than others due to the type of rock or sediment underneath. InSAR imagery would allow emergency response agencies to focus on places that may have sustained more damage due to stronger shaking than expected. GPS has proved to allow very rapid and accurate determination of an earthquake’s magnitude. 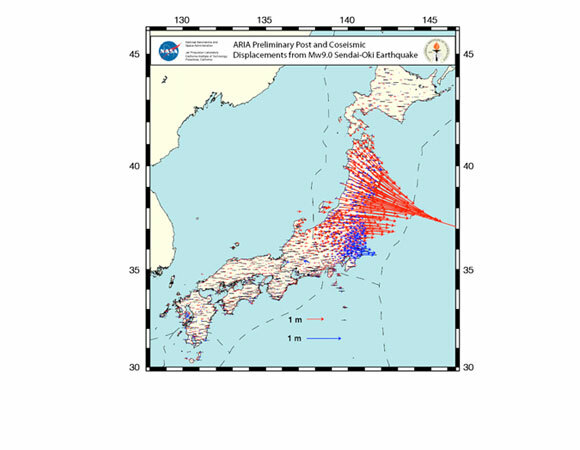 Traditionally magnitude is determined using seismic records that measure ground shaking, however, a magnitude calculation can take ten minutes or more. 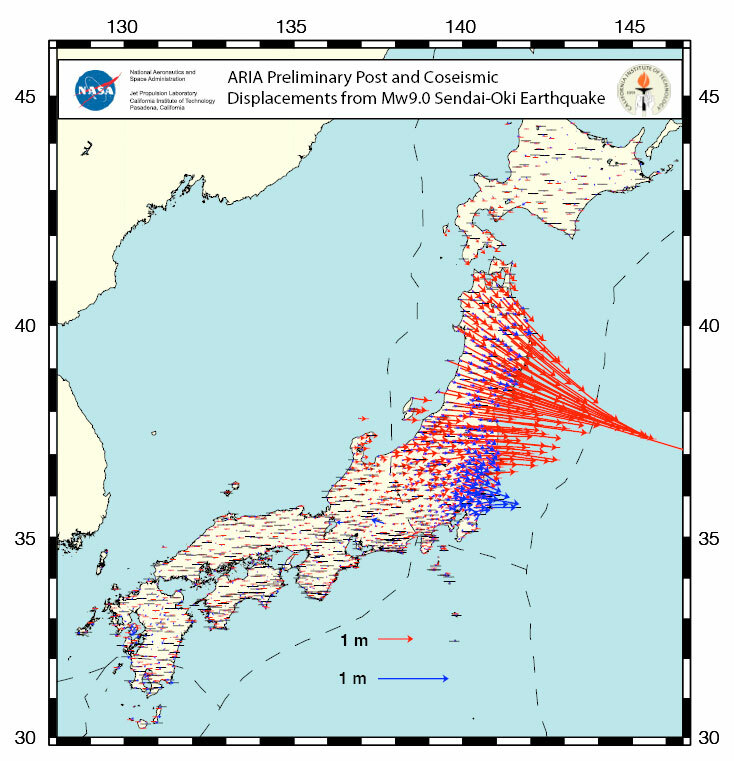 GPS, which measures actual ground movement (such as permanent motion caused by the earthquake), allows a magnitude to be automatically calculated in seconds. Also, because GPS is measuring the ground movement, scientists can quickly create an accurate model of how much and where the earthquake-generating fault moved below the surface of the earth. These types of calculations can be automated, and can help emergency workers pinpoint locations that are likely to be the most damaged. Currently the group has been using InSAR and GPS data from recent earthquakes to create a program that will automatically determine areas that would need the most urgent help from emergency workers. 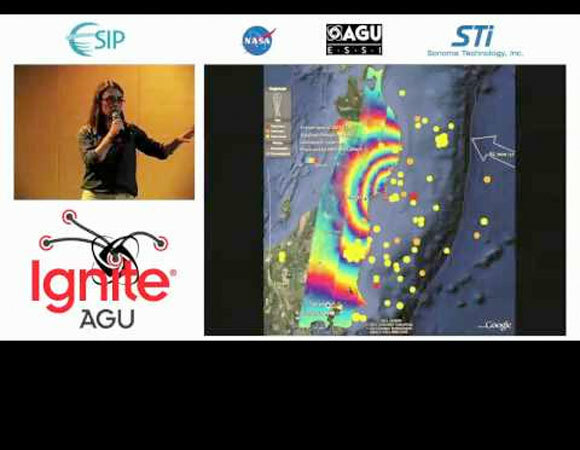 They have been working with data from the 2011 magnitude 9.0 Tohoku-oki and the 2011 magnitude 6.3 Christchurch event. Owen, S. E.; Webb, F.; Simons, M.; Rosen, P. A.; Cruz, J.; Yun, S.; Fielding, E. J.; Moore, A. W.; Hua, H.; Agram, P. S. (2011), The ARIA-EQ project: Advanced Rapid Imaging and Analysis for Earthquakes. American Geophysical Union, Fall Meeting 2011, abstract #IN11B-1298.